As a troubleshoot to ensure Insight can link to the Kingdom's SQL database, check that Windows services for SQL Server (SMTKINGDOM) and SQL Server Browser are running. Double-click Services to open the Services window. 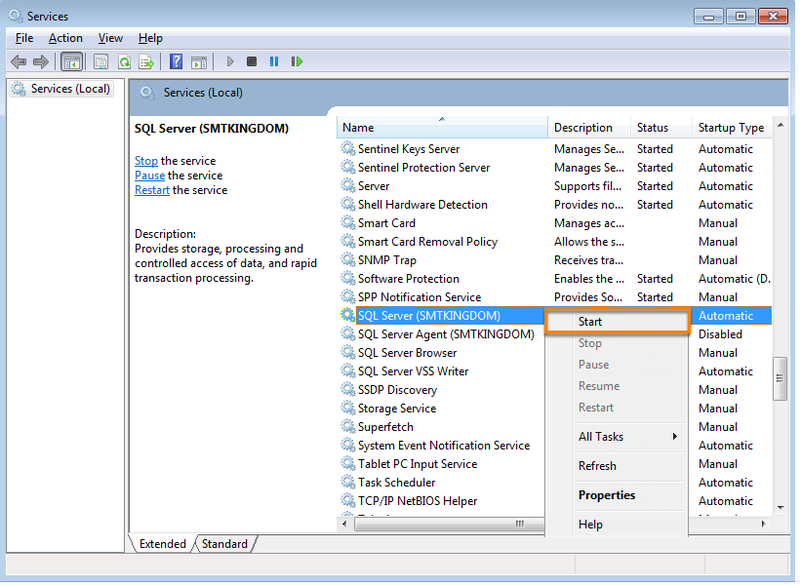 Make sure the status of SQL Server (SMTKINGDOM) and SQL Server Browser are showing as Started. If not, right-click the service and click Start. Tip: You can set SQL Server (SMTKINGDOM)** and SQL Server Browser to automatically run every time you turn on your computer. To do this, right-click on the service, click on Properties and select Automatic at Startup type. If you are still having trouble connecting to Kingdom, see Enable TCP/IP in the SQL Server. ** The instance can have any name applied. For users with Kingdom already installed the instance name will be, by default, SMTKINGDOM. Users with a fresh Insight install will be named DUGINSIGHT.